The 550-sheet drawer supports A4, A5, JIS B5, Folio, Letter, Legal, Executive and Oficio sizes. Paper (20 to 58 lb., 75 to 218 gsm. ), transparencies, labels and card stock may be used from this drawer (Includes 550-Sheet Tray). Paper size, paper and tray-present sensing are supported. Paper size, paper and tray-present and tray-low sensing are supported. Size detection is enabled for A4, letter and legal paper. Other standard sizes may be selected if automatic size detection is turned off. 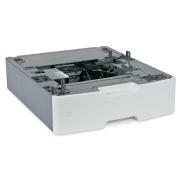 The 550-sheet drawer supports A4, A5, JIS B5, Folio, Letter, Legal, Executive and Oficio sizes. Paper (20 to 58 lb., 75 to 218 gsm. ), transparencies, labels and card stock may be used from this drawer (Includes 550-Sheet Tray). Labels, Card Stock, Plain Paper, Transparencies, Refer to the Card Stock & Label Guide.